Barbara Myers has been involved in the natural health field for over 30 years. Barbara is a traditional naturopath (Doctor of Naturopathy) earning her degree from Trinity School of Natural Health. Barbara received her Certified Nutritional Counselor (CNC) and Master Herbalist (MH) from Trinity School of Natural Health. 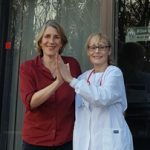 Barbara is the current President of PA Traditional Naturopaths Association. Barbara continues to study advanced herbalism & aromatherapy as the plants are her first love. Barbara fell in love with the Art of Jin Shin Jyutsu while taking a Jin Shin Jyutsu class. She completed the necessary hours to be endorsed as a Practitioner. Jin Shin Jyutsu is a study of a lifetime and Barbara has dedicated herself to that study. She founded a Jin Shin Jyutsu study group in her local area and she continues strong ties with Morristown Hospital Jin Shin Jyutsu group in New Jersey where Jin Shin Jyutsu is used in the cardiac and cancer centers. Barbara developed two businesses, Simple Sister in 2005 and Total Wellness Solutions in 2008. Simple Sister makes personal care products. Simple Sister has been contracted to sell exclusively to Willow Health Food & Wellness Center. Total Wellness Solutions was a Holistic wellness practice working with clients. Total Wellness Solutions has been dissolved and those services will be offered through Willow Health Food & Wellness Center. Barbara has taught classes in Natural Health & Herbalism at Willow Health, Curves and Wellness Works. Barbara worked Simple Sister and Total Wellness Solutions out of her home and Wellness Works in Chalfont, PA until she bought The Health Food Store in July 2012. Barbara has moved all her holistic practices to the store. The store was renamed Willow Health Food & Wellness Center. She continues to practice and has added many local practitioners to the wellness center. Barbara has been a DIY’er for many years and loves to pass along her experience in the classes she has developed and continues to teach at Willow Health Food & Wellness Center. You can check out Barbara’s classes on the website.